I’m afraid I don’t have a good answer. I actually haven’t thought much about how to teach people how to come to belief, beyond arguing for doing this as a social process (the ol’ “knowledge is a network” argument :) I have a pretty good sense of how *not* to do it: the way philosophy teachers relentlessly show how every proposed position can be torn down. I wonder what we’d learn by taking a literature course as a model — not one that is concerned primarily with critical method, but one that is trying to teach students how to appreciate literature. Or art. The teacher tries to get the students to engage with one another to find what’s worthwhile in a work. Formally, you implicitly teach the value of consistency, elegance of explanation, internal coherence, how well a work clarifies one’s own experience, etc. Those are useful touchstones for coming to belief. I wouldn’t want to leave students feeling that it’s up to them to come up with an understanding on their own. I’d want them to value the history of interpretation, bringing their critical skills to it. The last thing we need is to make people feel yet more unmoored. I’m also fond of the orthodox Jewish way of coming to belief, as I, as a non-observant Jew, understand it. You have an unchanging and inerrant text that means nothing until humans interpret it. To interpret it means to be conversant with the scholarly opinions of the great Rabbis, who disagree with one another, often diametrically. Formulating a belief in this context means bringing contemporary intelligence to a question while finding support in the old Rabbis…and always always talking respectfully about those other old Rabbis who disagree with your interpretation. No interpretations are final. Learned contradiction is embraced. That process has the elements I personally like (being moored to a tradition, respecting those with whom one disagrees, acceptance of the finitude of beliefs, acceptance that they result from a social process), but it’s not going to be very practical outside of Jewish communities if only because it rests on the acceptance of a sacred document, even though it’s one that literally cannot be taken literally; it always requires interpretation. My point: We do have traditions that aim at enabling us to come to belief. Science is one of them. But there are others. We should learn from them. Google PAIR (People + AI Research) has just posted my attempt to explain what fairness looks like when it’s operationalized for a machine learning system. It’s pegged around five “fairness buttons” on the new Google What-If tool, a resource for developers who want to try to figure out what factors (“features” in machine learning talk) are affecting an outcome. I’ll write more about this at some point, but for me the big take-away is that fairness has had value as a moral concept so far because it is vague enough to allow our intuition to guide us. Machine learning is going to force us to get very specific about it. But we are not yet adept enough at it — e.g., we don’t have a vocabulary for talking about the various varieties — plus we don’t agree about them enough to be able to navigate the shoals. It’s going to be a big mess, but something we have to work through. When we do, we’ll be better at being fair. Now, about the fact that I am a writer-in-residence at Google. Well, yes I am, and have been for about 6 weeks. It’s a 6 month part-time experiment. My role is to try to explain some of machine learning to people who, like me, lack the technical competence to actually understand it. I’m also supposed to be reflecting in public on what the implications of machine learning might be on our ideas. I am expected to be an independent voice, an outsider on the inside. So far, it’s been an amazing experience. I’m attached to PAIR, which has developers working on very interesting projects. They are, of course, super-smart, but they have not yet tired of me asking dumb questions that do not seem to be getting smarter over time. So, selfishly, it’s been great for me. And isn’t that all that really matters, hmmm? Primavera De Filippi is an expert in blockchain-based tech. She is giving a ThursdAI talk on Plantoid, an event held by Harvard’s Berkman Klein Center for Internet & Society and the MIT Media Lab. 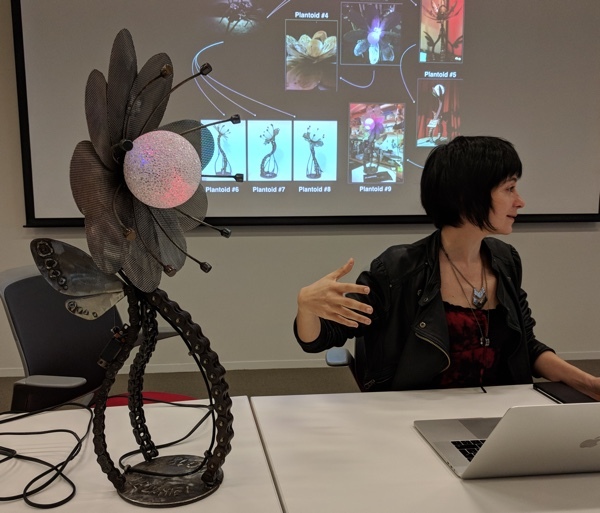 Her talk is officially on operational autonomy vs. decisional autonomy, but it’s really about how weird things become when you build a computerized flower that merges AI and the blockchain. For me, a central question of her talk was: Can we have autonomous robots that have legal rights and can own and spend assets, without having to resort to conferring personhood on them the way we have with corporations? She begins by pointing to the 3 industrial revolutions so far: Steam led to mechanized production ; Electricity led to mass production; Electronics led to automated production. The fourth — AI — is automating knowledge production. With autonomous things, the user and third parties become less liable as the software developer takes on more of the liability: There can be a bug. Someone can hack into it. The rules that make inferences are inaccurate. Or a bad moral choice has led the car into an accident. The sw developer might have created bug-free sw but its interaction with other devices might lead to unpredictability; multiple systems operating according to different rules might be incompatible; it can be hard to identify the chain of causality. So, who will be liable? The manufacturers and owners are likely to have only limited liability. So, maybe we’ll need generalized insurance: mandatory insurance that potentially harmful devices need to subscribe to. Or, perhaps we will provide some form of legal personhood to machines so the manufacturers can be sued for their failings. Suing a robot would be like suing a corporation. The devices would be able to own property and assets. The EU is thinking about creating this type of agenthood for AI systems. This is obviously controversial. At least a corporation has people associated with it, while the device is just a device, Primavera points out. So, when do we apply legal personhood to non-humans? In addition to people and corporations, some countries have assigned personhood to chimpanzees (Argentina, France) and to natural resources (NZ: Whanganui river). We do this so these entities will have rights and cannot be simply exploited. Decisional autonomy is the capacity to make a decision on your own, but it doesn’t necessarily bring what we think of as real autonomy. E.g., an AV can decide its route. For real autonomy we need operational autonomy: no one is maintaining the thing’s operation at a technical level. To take a non-random example, a blockchain runs autonomously because there is no single operator controlling. E.g., smart contracts come with a guarantee of execution. Once a contract is registered with a blockchain, no operator can stop it. This is operational autonomy. She introduces Plantoid, a blockchain-based life form. “Plantoid is autonomous, self-sufficient, and can reproduce.”It’s autonomous, self-sufficient, and can reproduce. Real flowers use bees to reproduce. Plantoids use humans to collect capital for their reproduction. Their bodies are mechanical. Their spirit is an Ethereum smart contract. It collects cryptocurrency. When you feed it currency it says thank you; the Plantoid Primavera has brought, nods its flower. When it gets enough funds to reproduce itself, it triggers a smart contract that activates a call for bids to create the next version of the Plantoid. In the “mating phase” it looks for a human to create the new version. People vote with micro-donations. Then it identifies a winner and hires that human to create the new one. There are many Plantoids in the world. Each has its own “DNA”. New artists can add to it. E.g., each artist has to decide on its governance, such as whether it will donate some funds to charity. The aim is to make it more attractive to be contributed to. The most fit get the most money and reproduces themselves. BurningMan this summer is going to feature this. Every time one reproduces, a small cut is given to the pattern that generated it, and some to the new designer. This flips copyright on its head: the artist has an incentive to make her design more visible and accessible and attractive. So, why provide legal personhood to autonomous devices? We want them to be able to own their own assets, to assume contractual rights, and legal capacity so they can sue and be sued, and limit their liability. “ Blockchain lets us do that without having to declare the robot to be a legal person.” Blockchain lets us do that without having to declare the robot to be a legal person. Who are the parties to the contract? The original author and new artist? The master agreement? Who can sue who in case of a breach? We don’t know how to answer these questions yet. A: Yes. Plantoid has already been forked this way. There’s an idea for a forest offering trees to be cut down, with the compensation going to the forest which might eventually buy more land to expand itself. My interest in this grew out of my interest in decentralized organizations. This enables a project to be an entity that assumes liability for its actions, and to reproduce itself. Q: [me] Do you own this plantoid? A: Hmm. I own the physical instantiation but not the code or the smart contract. If this one broke, I could make a new one that connects to the same smart contract. If someone gets hurt because it falls on the, I’m probably liable. If the smart contract is funding terrorism, I’m not the owner of that contract. The physical object is doing nothing but reacting to donations. A: It will be up to the judge. Q: What are the most likely senarios for the development of these weird objects? A: A blockchain can provide the interface for humans interacting with each other without needing a legal entity, such as Uber, to centralize control. But you need people to decide to do this. The question is how these entities change the structure of the organization. — Ludwig Wittgenstein, Philosophical Investigations, 1953. The draft is a big discovery. Camilla Shumaker at Research Frontiers reports that Jeremy Hyman, a philosophy instructor at the University of Arkansas, came across a reference to the manuscript and hied off to a municipal library in Toulouse … a gamble, but he apparently felt he had nothing left Toulouse. Robert Epstein argues in Aeon against the dominant assumption that the brain is a computer, that it processes information, stores and retrieves memories, etc. That we assume so comes from what I think of as the informationalizing of everything. The strongest part of his argument is that computers operate on symbolic information, but brains do not. There is no evidence (that I know of, but I’m no expert. On anything) that the brain decomposes visual images into pixels and those pixels into on-offs in a code that represents colors. In the second half, Epstein tries to prove that the brain isn’t a computer through some simple experiments, such as drawing a dollar bill from memory and while looking at it. Someone committed to the idea that the brain is a computer would probably just conclude that the brain just isn’t a very good computer. But judge for yourself. There’s more to it than I’m presenting here. It is of the essence of information that it is independent of its medium: you can encode it into voltage levels of transistors, magnetized dust on tape, or holes in punch cards, and it’s the same information. Therefore, a representation of a brain’s states in another medium should also be conscious. Epstein doesn’t make the following argument, but I will (and I believe I am cribbing it from someone else but I don’t remember who). Because information is independent of its medium, we could encode it in dust particles swirling clockwise or counter-clockwise; clockwise is an on, and counter is an off. In fact, imagine there’s a dust cloud somewhere in the universe that has 86 billion motes, the number of neurons in the human brain. Imagine the direction of those motes exactly matches the on-offs of your neurons when you first spied the love of your life across the room. Imagine those spins shift but happen to match how your neural states shifted over the next ten seconds of your life. That dust cloud is thus perfectly representing the informational state of your brain as you fell in love. It is therefore experiencing your feelings and thinking your thoughts. That by itself is absurd. But perhaps you say it is just hard to imagine. Ok, then let’s change it. Same dust cloud. Same spins. But this time we say that clockwise is an off, and the other is an on. Now that dust cloud no longer represents your brain states. It therefore is both experiencing your thoughts and feeling and is not experiencing them at the same time. Aristotle would tell us that that is logically impossible: a thing cannot simultaneously be something and its opposite. Toward the end of the article, Epstein gets to a crucial point that I was very glad to see him bring up: Thinking is not a brain activity, but the activity of a body engaged in the world. (He cites Anthony Chemero’s Radical Embodied Cognitive Science (2009) which I have not read. I’d trace it back further to Andy Clark, David Chalmers, Eleanor Rosch, Heidegger…). Reducing it to a brain function, and further stripping the brain of its materiality to focus on its “processing” of “information” is reductive without being clarifying. Maybe this time our tech-based metaphor has happened to get it right. But history says we should assume not. We should be very alert to the disanologies, which Epstein helps us with. Getting this right, or at least not getting it wrong, matters. The most pressing problem with the informationalizing of thought is not that it applies a metaphor, or even that the metaphor is inapt. Rather it’s that this metaphor leads us to a seriously diminished understanding of what it means to be a living, caring creature. Hat tip to @JenniferSertl for pointing out the Aeon article. I’ve been at a two-day workshop sponsored by the Michigan State Uiversity and the National Science Foundation: “Workshop on Trustworthy Algorithmic Decision-Making.” After multiple rounds of rotating through workgroups iterating on five different questions, each group presented its findings — questions, insights, areas of future research. Seriously, I cannot capture all of this. Who defines and how do we ensure good practice in data science and machine learning? Why is the topic important? Because algorithms are important. And they have important real-world effects on people’s lives. It can be difficult to generalize practices. Best practices may be good for one goal but not another, e.g., efficiency but not social good. Also: Lack of shared concepts and vocabulary. How to mitigate the problems? Aspirationally casual: measuring outcomes causally but not always through randomized control trials. The goal is not to shut down algorithms to to make positive contributions that generat solutions. Lack of variation in accountability, enforcements, and interventions. Why progress is possible: There’s a lot of good activity in this space. And it’s early in the topic so there’s an ability to significantly influence the field. What are the barriers for success? Incomplete understanding of contexts. So, think it in terms of socio-cultural approaches, and make it interdisciplinary. The topic lies between disciplines. So, develop a common language. High-level triangulation is difficult. Examine the issues at multiple scales, multiple levels of abstraction. Where you assess accountability may vary depending on what level/aspect you’re looking at. The problem: How might we holistically treat and attribute uncertainty through data analysis and decisions systems. Uncertainty exists everywhere in these systems, so we need to consider how it moves through a system. This runs from choosing data sources to presenting results to decision-makers and people impacted by these results, and beyond that its incorporation into risk analysis and contingency planning. It’s always good to know where the uncertainty is coming from so you can address it. End users are bad at evaluating uncertain info and incorporating uncertainty in their thinking. We have sampling-based solutions that provide a framework. How to evaluate and recognize success? Gaps in theory: many of the problems cannot currently be solved algorithmically. The presentation ends with a note: “In some cases, uncertainty is a useful tool.” E.g., it can make the system harder to game. Adversarial examples: add a perturbation to a sample and it disrupts the classification. An adversary tries to find those perturbations to wreck your model. Sometimes this is used not to hack the system so much as to prevent the system from, for example, recognizing your face during a protest. Feedback loops: A recidivism prediction system says you’re likely to commit further crimes, which sends you to prison, which increases the likelihood that you’ll commit further crimes. What is the problem: How should a trustworthy algorithm account for adversaries, workarounds, and feedback loops? System designers, users, non-users, and perhaps adversaries. Why is this a difficult problem? From whose vantage point do we define adversarial behavior, workarounds, and feedback loops. How do we reason about the incentives users and non-users have when interacting with systems in unintended ways. How do we monitor changes, assess anomalies, and implement safeguards? How do we account for stakeholders while preserving rights? Test . Try to break things. Hard to define the problem in particular cases. What constitutes adversarial behavior vs. a workaround is subjective. How do you define and operationalize trust. The problem: What are the processes through which different stakeholders come to trust an algorithm? Multiple processes lead to trust. Procedural vs. substantive trust: are you looking at the weights of the algorithms (e.g. ), or what were the steps to get you there? Social vs personal: did you see the algorithm at work, or are you relying on peers? These pathways are not necessarily predictive of each other. The agency uses a predictive algorithm. The stakeholders range from the children needing a family, to NYers as a whole. The agency knew what into the model. “We didn’t buy our algorithm from a black-box vendor.” They trusted the algorithm because they staffed a technical team who had credentials and had experience with ethics…and who they trusted intuitively as good people. Few of these are the quantitative metrics that devs spend their time on. Note that FAT (fairness, accountability, transparency) metrics were not what led to trust. Processes that build trust happen over time. The timescales to build social trust are outside the scope of traditional experiments,” although you can perhaps find natural experiments. We generated a lot of scribbles, post-it notes, flip charts, Slack conversations, slide decks, etc. They’re going to put together a whitepaper that goes through the major issues, organizing them, and tries to capture the complexity while helping to make sense of it. Isolating the algorithm as an instantiation misses the socio-technical factors in trust. from the participants are online. (Here’s mine.) I may do some live-blogging of the workshops. – Key problems and critical qustionos? – What to tell pol;icy-makers and others about the impact of these systems? – What ideas, people, training, infrastructure are needed for these approaches? Excellent diversity of backgrounds: CS, policy, law, library science, a philosopher, more. Good diversity in gender and race. As the least qualified person here, I’m greatly looking forward to the conversations. Steve Thomas [twitter: @stevelibrarian] of the Circulating Ideas podcast interviews me about the messiness of meaning, library innovation, and educating against fake news.